Twice abbot of St Albans (1420-1440, 1451-1465), John de Whethamstede called his four-volume compendium of history and classical literature the 'Granarium', a play on his name ('Wheathamstead') and on the 'kernels' of knowledge arranged alphabetically within it. Accused of neglecting his job because he spent so much time in pursuit of his studies and funds to beautify the monastery, he based his massive compendium on classical authors and the 14th-century Italian writer Boccacio. He was the first English author to write a history in a humanist style, although he shaped the mythological content to a moralising Christian purpose. Each section of the book begins with a beautifully painted first letter. This is from volume four, entitled 'On Illustrious Men' although it seems to include entries on places and poetry also. 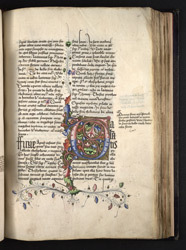 The manuscript was probably made during his lifetime, its fine decoration suggesting some relationship to the beautifully decorated two-volume copy presented by Whethamstede's patron, Humphrey Duke of Gloucester, to the library at Oxford. This page refers to the Furies and their role in Vergil's "Aeneid".